Gatte is sabzi is popular in Rajasthan. 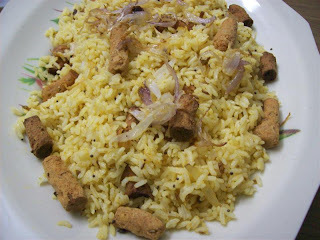 The gattas are used in rice preparation too, this is called gatte ka pulav/pulao. It is spicy and is delicious like a curry. Mix all the ingredients for the gattas, mix in a little water to make a firm dough. Divide into six equal parts and roll into cylindrical shape. Stir fry in two cup of boiling water for ten to fifteen minutes. Drain. Let the gattas cool a bit. Wash and soak rice for 1 hour. Heat up ghee, mix in cumin seeds, when they crackle mix in whole garam masala, stir fry for a minute then mix in asafoetida powder. Mix in turmeric powder, red chilli powder, garam masala, coriander powder and ginger paste, stir fry for 2-3 minutes. Note: Dont stir the rice often after adding gattas. Or else it tends to get broken.